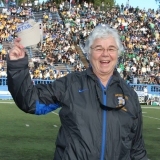 Carolyn Lewis worked at San Jose State University for 29 years and retired in 2003 as the Senior Associate Athletic Director. Carolyn's career experience focused on overseeing internal operations of the Athletic Department and coaching various sports teams, including Field Hockey. Between 1976 and 1987, Carolyn consistently led and coached the San Jose State University Field Hockey team onto the nation's Top 10 list. During the same period, Carolyn also coached two Field Hockey team members to the National team level; served on the USA Field Hockey National Squad Coaching Staff; and was twice selected conference Coach of the Year. Carolyn also has strong public speaking skills and experience. She travels and hosts presentations for high school students regarding attending college and the acquisition of athletic scholarships. During her professional career she held many leadership positions including the United States Field Hockey Association Vice President for Administration, Interim Director of Athletics and President's Cabinet at San Jose State, and member of the NCAA Women's Gymnastics Committee. She was chair of the SJSU Gender Equity Committee and was instrumental in establishing the SJSU Gender Equity Plan and starting three new women's intercollegiate athletic teams (Soccer, water polo, and cross County. In retirement she has continued to stay involved in her local community through the following activities: Girls' Basketball Head Coach at Pacific Collegiate School (five years), Monterey High School Sports Professions and Recreation Careers Advisory Board, docent at Seacliff State Beach, SJSU Alumni Association Santa Cruz Area Chapter Board (current President), and Treasurer and Board member for Trout Gulch Mutual Water Company. Her hobbies include sailing, traveling and gardening. She represents the SJSU Alumni; by serving on the San Jose State University Alumni Association Board of Directors and raises scholarship money for Santa Cruz Area students to attend San Jose State University.